“Fostering and practicing forgiveness has the power to transform deep-seated responses to memories and legacies of injustice, conflict and war. It can liberate people from being imprisoned in their pasts and long ingrained mental and emotional conditions created by such legacies.” To read more click here. Compassion Workshops were held on Tuesday 2nd February and Thursday 4th February at the Nishkam Centre, in collaboration with Nishkam Primary School. 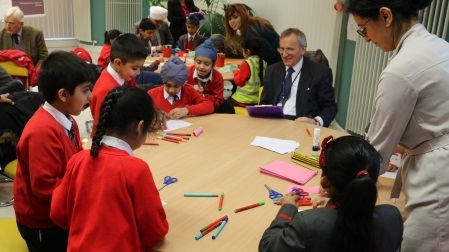 In these workshops, which were held as part of World Interfaith Harmony Week, Key Stage 1 pupils were guided to explore two of the 24 dispositions: ‘Compassion’ and ‘Being Modest and Listening to Others’. These workshops were designed to begin to help children understand the meaning of the 24 spiritual and moral dispositions, as outlined in Birmingham’s Religious Education syllabus. This event marks the start of a broader initiative to develop similar workshops in innovative ways so they can be shared with other schools. To read more click here. Spreading Harmony and Tolerance among all the world’s religions. An evening of kirtan and reflection took place at the Nishkam Centre followed by a vegetarian meal. An Information and Action Event was held at the Nishkam Centre on Saturday 2nd February 2013. It provided an opportunity for faith, interfaith groups and organisations to showcase what is being done to provide an effective response to poverty. Guests were invited to attend and participate in this opportunity to share good practice, to learn from each other and to help colleagues throughout the City who are working to make a difference in the lives and wellbeing of our neighbours. This conference was held in collaboration with Jubilee Debt Campaign, a multifaith social action organisation demanding an end to the scandal of poor countries paying money to the rich world. They are calling for 100% cancellation of unpayable and unjust poor country debts. The ‘Faith in Justice’ conference had a focus on the Dharmic Faith’s attitude to the role that debt plays in global poverty. The Dharmic Faiths which took part were Buddhist, Hindu, Sikh, Jain and Zoroastrian. The event was chaired by Rev Prof Michael Taylor. The purpose of the conference was to raise awareness of Dharmic Faiths with other faith communities and also to raise awareness of the Jubilee Debt Campaign Multifaith project during World Interfaith Harmony Week. This conference was held in collaboration with Birmingham Citizens, an umbrella organisation for citizens in Birmingham. Its mission is to create a network of citizens who act responsibly in the public life of their communities and are able to influence, for the common good, decisions which impact on their communities. The conference focussed on how to create positive change in neighbourhoods, and aimed to bring the communities of Birmingham together to discuss issues affecting their neighbours and to discuss what action could be taken to make a real change. 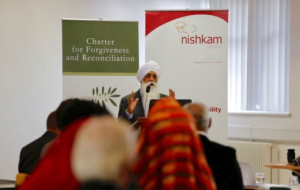 The conference included reflections from the City’s Faith leaders and group discussions.